If you’re looking for the right kind of water conditioning for your home, then contact the professionals at Guaranteed Plumbing. We are the Raleigh Water Filtration Systems experts for the central North Carolina area. We offer a complete line of residential water softeners, whole house water filter systems and pure drinking water systems that are right for you. Our systems are affordable and stay well within your budget. Our Raleigh Water Filtration Systems will provide your entire home with endless pure, soft water every time you turn on your faucet. 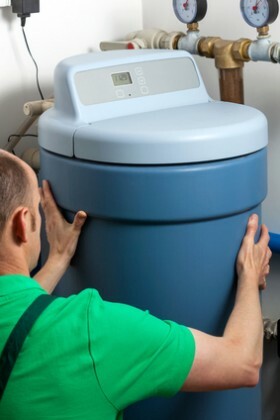 We offer a broad spectrum of systems ranging from modern whole house water-generated systems to conventional softeners that are targeted for key areas or rooms of your house. Contact a Guaranteed Plumbing professional today to set up a consultation in order to find the right water conditioning system for you. There are numerous benefits of our Raleigh Water Filtration Systems. For instance, you’ll instantly start feeling how soft your hair and skin become. Clothes washed in soft water turn out softer and cleaner. Your appliances operate more efficiently in softer water which saves you money. Softer water either minimizes or eliminates lime and scum buildup in your sink, tubs and toilets. You’ll notice a difference with small items like noticeably spot free dishes and glasses. The benefits are countless, and you’ll thank our Raleigh plumbers for helping you install your new water softening system. Contact us today to discover all the benefits and options available to you. Our Raleigh Water Filtration Systems are installed into your home’s plumbing system in order to purify the water from all types of harmful contaminates. Tap water in Raleigh – whether it’s city water or well water – contains numerous bacteria and other harmful particles that have the potential to affect your health. City and country filtration systems do not adequately clean all the impurities that inhabit your water supply. A filtration system from Guaranteed Plumbing give you a fresh, clean supply of water that you can feel confident is good for your body. Unlike bottled water filtered water gets rid of all the unhealthy impurities while still preserving the healthy vitamins and minerals that are good for your body. Filtered water also creates all-natural water without adding preservatives, chlorine, or other chemicals that are commonly added to water. You get all the benefits of pure natural water without all the bi-products. You can choose from various types of water filters that range from single units for your kitchen or bathroom, to comprehensive systems that filter water in every faucet in your home creating an entire healthy water environment. Larger system scan filter water for longer period of time and do not require regular filter changes as often. Let our team of professionals help you choose which water filtering system is right for you. Contact Guaranteed Plumbing today! If you are looking for Raleigh Water Filtration Systems then please call 919-PLUMBER (919-758-6237) or complete our online request form. "Guaranteed Plumbing was quick when they come to my house on Saturday, to do a plumbing repair. I [...]"
"Michael came and fixed a leak I had due to my quest pipe. I was impressed with the [...]"